We just found out we have 2 1/2 openings for Retreat. 2 people had to cancel due to unforeseen circumstances and we have 1 Friday only to share with another person who wishes to come Saturday only. If you are interested in filling in - it will be a BLAST! - give us a jingle at 815-879-3739. Cost is just $120 for the retreat or $60 for the 1 day. We will be waiting for your call!!! Check out our new Cutie - Every Which Way! If you aren't familiar with our cuties, each quilt takes 1 or 2 Cutie packs plus extra fabric for the background and borders. What is a Cutie pack? It is 16 fat eighths. The fun part of doing these quilts is that any Cutie Pack works for any Cutie pattern. 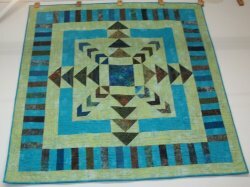 It is fun seeing the quilts done up in different color ways. Come in and check out all of our samples. It is hard to believe we are on our 5th week of The Women of the Bible. Look for your FREE pattern HERE! Kudos to those of you who are keeping up each week. We enjoy seeing the blocks. 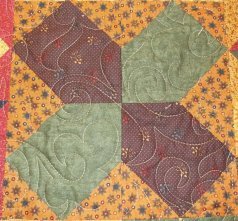 Remember to post your finished blocks on Facebook so you can be put into our $10 gift certificate drawing at the end of the month. Also, don't forget that we will keep ALL of the patterns up on Facebook. If you miss a week by e-mail, you can just go to our Facebook page and copy off the pattern.